Would you believe I'm still sifting through material I gleaned from the Woodworking in America conference in Valley Forge in October? As I've said, the marketplace was one of the best attractions at the show because you could talk directly with tool makers and take their tools for a test drive. This is really the best way to find out if you and a tool can play nicely together. It's one thing to read a review, but it doesn't compare to actually trying the tool first hand. 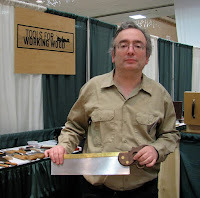 Joel Moskowitz, from Tools for Working Wood, showed me his new sash saw (which should be available soon) and saw vise. So, what makes these tools special? According to Joel, nobody else makes a saw vise these days. He said, "Lots of people tried the vise out during the show and, except for Adam Cherubini who didn't like that really shallow dovetail saws don't fit (they don't fit on Disston D3's either or most other saw vises—you just stick out the last inch and file away), we got pretty much raves from everyone." I talked with a show-goer who said what he liked best about the vise was that it supported the blade along its entire length, even in the middle. There was no chatter when he filed the teeth. 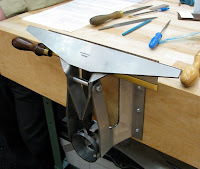 Regarding the sash saw, Joel believes it will be the lightest one on the market, which he says will make it easier to sense square and saw for long periods of time. Also, the handle is very elegant—the lamb's tongue "just licks the blade." The saw is filed rip with a little fleam. Joel remarked that many people at the show were amazed that it cut both rip and crosscut "pretty darn well and fast." I tried out Joel's sash saw and was impressed that it did indeed cut just as well on the rip as it did the crosscut. Although I did not order either one of these tools, I did buy a bunch of other products from him. That's the other thing about trying tools in person—it makes it hard to walk away empty handed.